Beadhead Hares Ear Nymphs, Prince Nymphs, Pheasant Tail Nymphs. Elk Hair Caddis, PMD's, Light Cahill and Adams (parachute and standard). Tangle Lake teaser (a variation of elk hair caddis) kills in the waters near Paxton. A Green Domino is my favorite nymph, but they are almost impossible to find. Generally speaking I find grayling are not real selective. If you come out to the denali highway ,,im pretty sure a piece of fuzz with a hook will bring you in a grayling. Yup. My wife tied a brown and white fly using some of my Springer Spaniels hair one day and caught fish with it. His name is Zach so we named it the Zachiebugger. It looked like a miniature brown and white wooly bugger. Hence the name. I always see how many different flys I can catch them on. Dry and wet. has been one of my favorites along the Denali. For dry's I like the mosquito, Brown hackle peacock and the gray hackle peacock. The Adams is a winner too. Most any dry pattern will work. In chop, pick one you can see and follow, otherwise about a size 14-16 black gnat with white hair wing or clipped foam wing. A friend spent a lot of time studying that very question- trying lots of patterns and his opinion (one I have a great deal of respect for) was that the black gnat seemed to be preferred. Other than that anything can/will work if they can get their mouth over it- small leeches, smolt patterns, wolly worms, egg patterns, beads, caddis, stoneflies, etc. What size WBs for Grayling? Maybe #10? Elk hair caddis and all its variations. Stimulator when they are really turned on. Bead head Hare's ears in natural for sub-surface. Thunder Creek's and Clouser's in a brown olive color. Dries are all 12 and under. Box is a beauty. These look like 4,6's, maybe 8's? 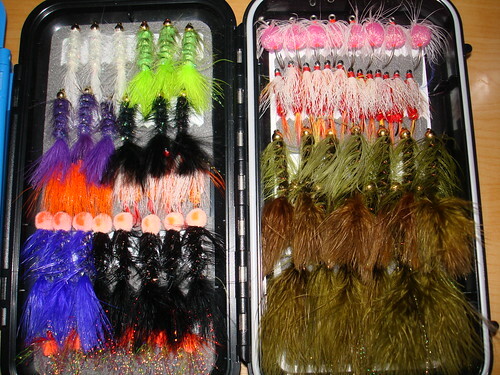 Dang Dan, I think you need to spend more time fishing, and less time organizing your fly boxes. Better yet, you could spend more time organizing my fly boxes like that. They are actually #2's. 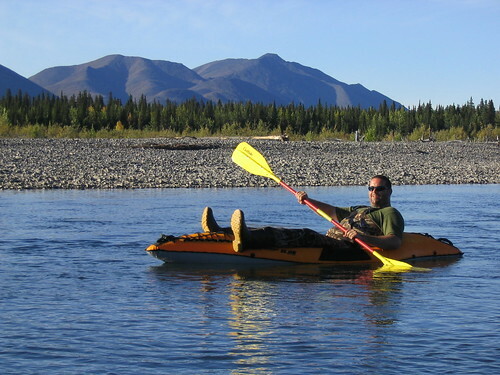 I mostly feed them to dollies/grayling in NW Alaska. Big grayling up there and even with their small mouths, they hit the #2's fine. Up there I feed them whatever I am throwing at the dollies. Many are in the 2-3 lb range and some bigger. Works like a charm. That olive wb in the middle water column has caught my biggest grayling. I spend all winter doing the same thing. Looking forward to fishing with you in a few weeks.